The fascinating phenomenon of color mixing is conveyed using LED technology. A great alternative to traditional ray box and filters, the ultra bright LEDs of the Color Mixing Apparatus prevent the need for full black out.The brightness of these LEDs can be adjusted using the control box, and either the inner or outer ring of lights can be selected, for a full range of experiments. 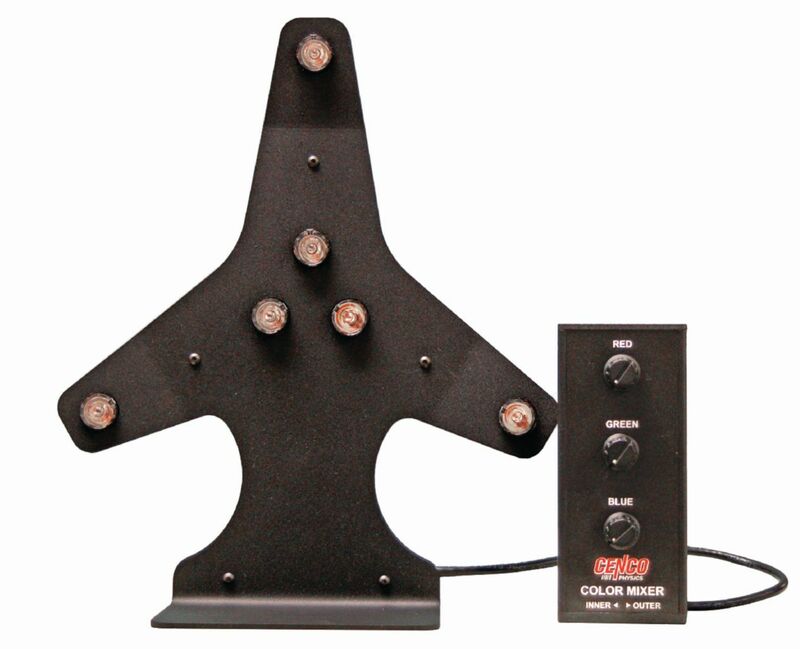 Set the apparatus in full rotation and use with the included screens to demonstrate both additive and subtractive color mixing. Using a blank white screen and the color mixer, you can highlight how color is perceived; use the black screen with aperture for projecting circular patches of light; or use a clear screen with an eclipse disc for blocking light. When you use the apparatus in conjunction with the various screens, you can highlight the way we see color and how colored light is created. Adding objects to the experiments, like a banana or a candy wrapper printed in primary colors, enables you to show the relationship between reflective light and color as well.